Hello everyone; yes, once again it is I, Mani the tiny purebred border collie, here to tell you all about my very interesting, and slightly scary, day. You may remember me from such posts as “My New Friend”, where I introduced myself. Here I am in a characteristic pose. Notice I have an outfit now. The guy I live with bought me a collar, but then decided to let me wear the one that the previous purebred border collie wore when he was little. “For a sense of continuity”, he said. I think I look very elegant indeed. How about another characteristic pose, to make things even more interesting? There isn’t any gardening going on, so I can talk about myself a whole lot. (This will be the best post so far, of course.) You see, the weather is “way too icky for gardening” and so the guy I live with has mostly concentrated on me, which is excellent. He did drag out a machine today, one which I understand has terrified purebred border collies here for many, many years. (Although I was told that this was a newer one, because the guy I live with broke the earlier one and had to buy a new one to make his companion happy, after she got upset at him for breaking the earlier one. The new one cost a lot of money and is, supposedly, “not to be attacked”.) It made a whole bunch of noise as it was pushed across the floor. And then after a few minutes, it got pushed across the floor again, and some soapy stuff flew all over the place, and the carpet got all wet. It was pretty scary. I didn’t run or anything like that; I just stood there and waited for it to stop. Eventually, it did. After all that was done, we went outside. You can see why there isn’t any gardening going on. That’s me there, surveying my domain. I checked out the rock garden. I don’t know why there’s no snow under the spruce (left) and the fir (right). The guy I live with says some plants do produce heat, so maybe that’s it. I went into the shed, which I went into yesterday, too, but I found something there that I “wasn’t supposed to have”, a piece of flower pot. I had to surrender it. The guy I live with explained why we don’t run with pieces of flower pot in our mouth, and he said he would make sure there weren’t any more in the shed. After that, though, I found a stick. I might make a whole post some day about how fun it is to find a stick. I think there are lots of sticks in the back yard. There really isn’t much of anything to compare with finding a stick. The guy I live with doesn’t seem to get all that excited when he finds a stick, and so I wonder if there’s something wrong with him. He likes me, so probably not. So that’s been my day. I thought I would leave you with my discovery last night, that I’m going to be very good at hiding from the guy I live with, or, as he put it, “trying not to be seen”. I’m almost invisible here. Thanks; finding the stick was really a highlight of my day. Though getting a rawhide chew was pretty good too. Then there was lunch. And quite a bit of cuddle time, of course. Mani I was staring at a couple of photos of you from the last two posts and had a revelation. You are Harry Potter incognito, with that blaze across your forehead it was a dead giveaway. Now only time will tell if your white blaze leans over your left eye in time like your predecessor or stays in the centre. I kind of think it will stay put. We do change a little as we age, or so I hear. Red is your color, Mani. The collar looks just right on you. 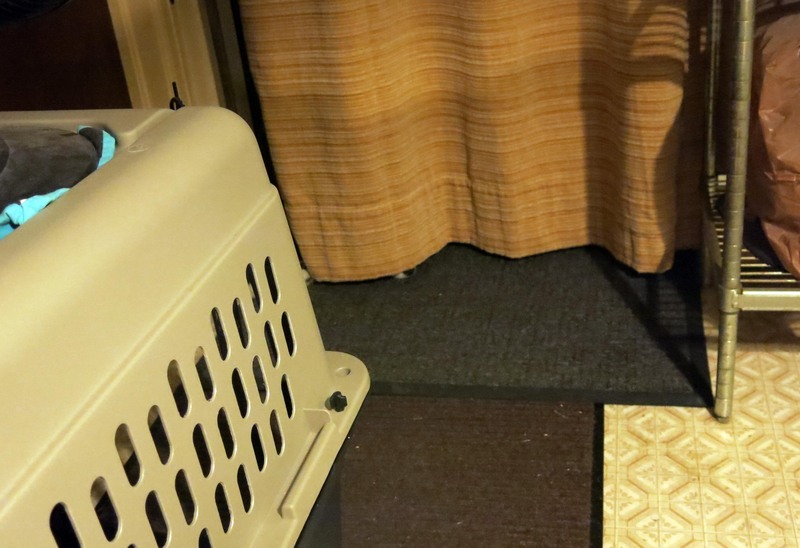 For such a little purebred border collie, you sure are fast! And quite the stick finder. It looks like you had an action packed day, even if it was too icky to garden. Thanks; the collar was kind of itchy at first, but then I got used to it. And just imagine having a whole yard full of sticks to find. If you run out of sticks there, you’re welcome to come here and pick up all the sticks that have blown down in my yard. Oh, that sounds like fun. I do get carsick, though. For now, anyway. 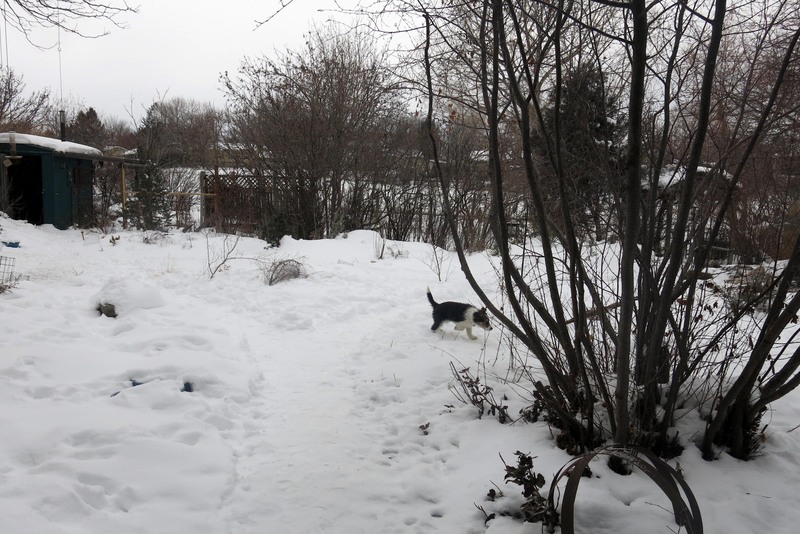 I bet there are even more sticks hiding under all that snow. Just wait till it melts! The yard will be a cornucopia of sticks. I’ll bet there will be. I’ve already noticed that there are paths. The guy I live with said the paths were made by border collies, and so I feel like I’m in good paws. Nothing better than a good stick, except maybe the triumphant prance of the dog who finds it. And that would be you. Any thawing coming your way? Sticks are excellent. If you ask the guy I live with, it might stop snowing in July…..The weather people say it will stop tomorrow, and warm up. There’s been snow on the ground for over two weeks, and the guy I live with is starting to talk to himself. I haven’t known him for very long, but I’m not going to worry just yet. I mean, he got me, so he must have some sense. Your run through the snow with the pot shard? I call that The Contraband Run. My dogs Petey and Shredder are masters. When I see them in the midst of *that movement*, I know they have found something they suspect I’d rather they not possess and are filled with delight over said possession and must express their emotion through The Contraband Run. 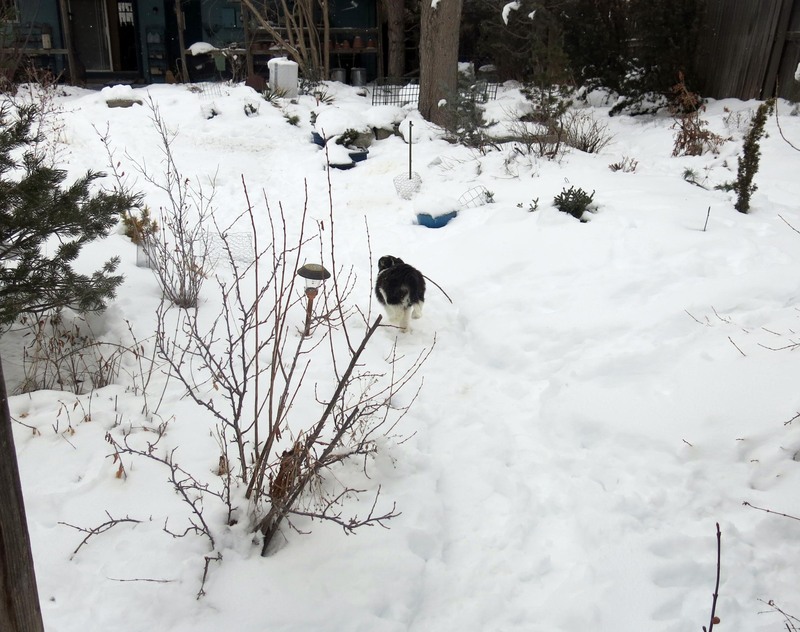 Oh, yes, Mani the tiny purebred border collie, I recognize that run. Excellent cute portraits today at the top of the post. 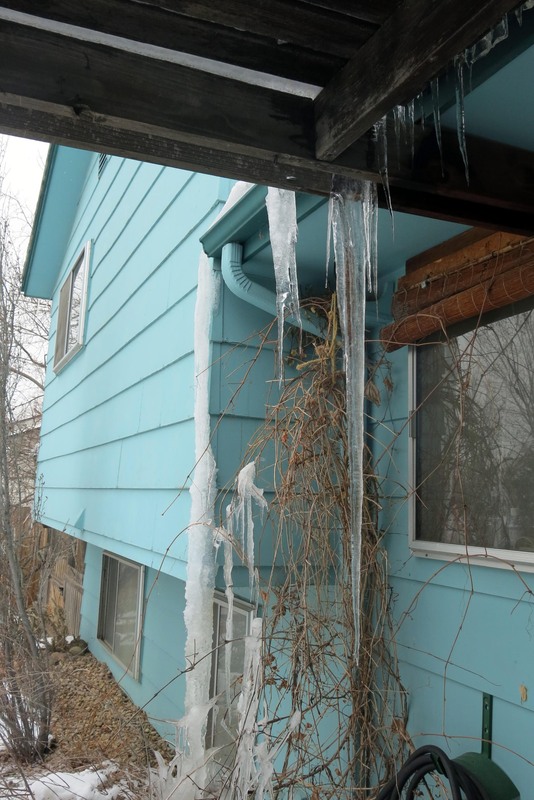 And a nice one of hanging ice. Thanks; I thought I was being cute. 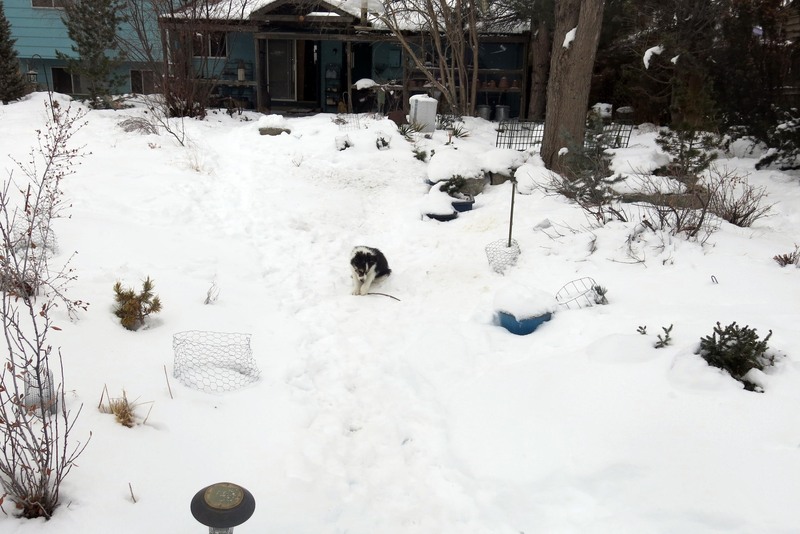 And the run from the shed, well, the piece of flower pot was too big for me to swallow, but it was “illegal” anyway, so I guess it turns out that there are more rules than I originally thought. It is. We don’t often have things like that here, but winters have changed, according to the guy I live with. 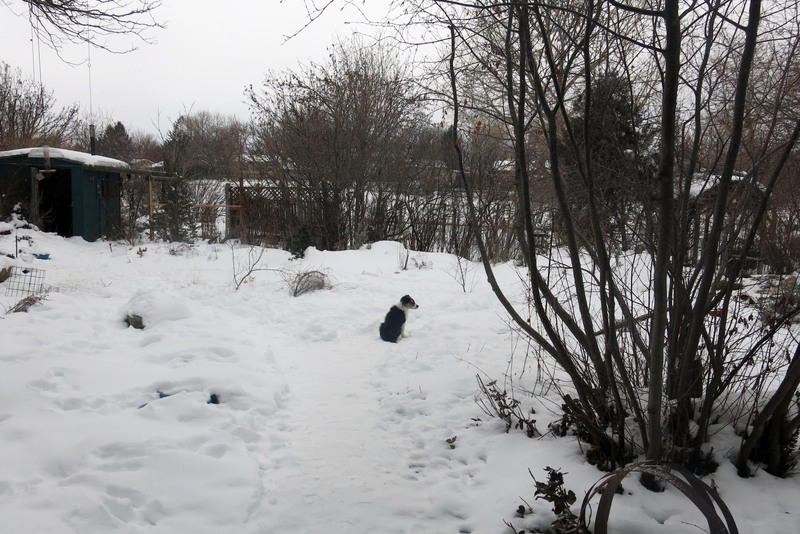 He says having snow on the ground, and snow falling, for over two weeks, is “just plain gross” and rarely happens here. I was kind of hoping for twelve months of snow. That would make your guy mighty cranky. But snow must feel great to a furry fellow like your fine self. Snow is really super excellent. It’s snowing again, even though it was “supposed to stop”. I would “like” your comment but I have mixed emotions as I want both you and your guy to like the weather. I am sure you keep him amused on indoor snow days. 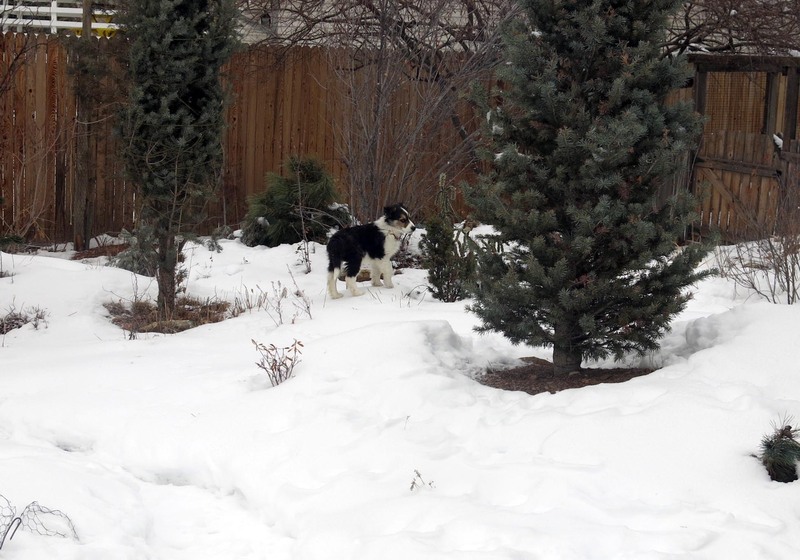 We purebred border collies like cool weather, and especially snow. Snow is so excellent, it’s excellent. We go outside a couple of times a day even when it’s cold, and he watches me run back and forth in the snow while he stands there complaining about how cold it is. 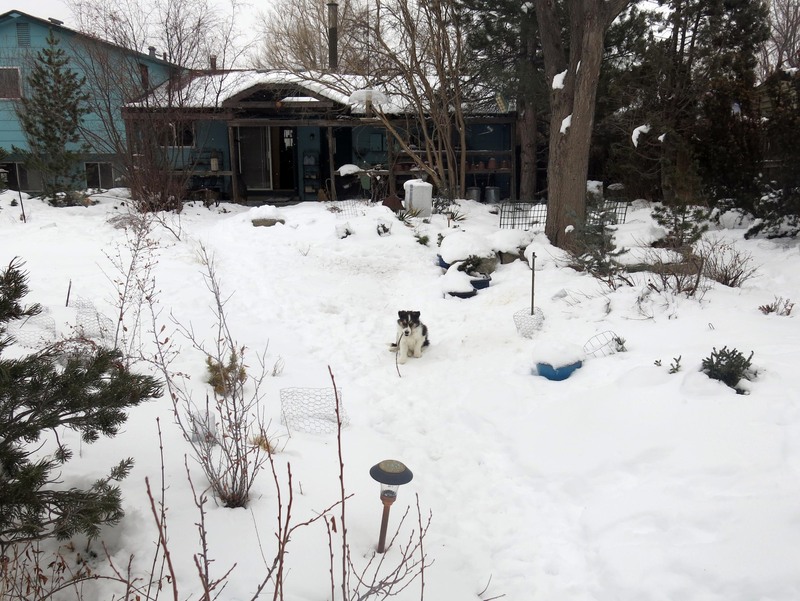 The guy I live with grudgingly admits that “the snow is good for the seed pots” outdoors, but he likes it about ninety degrees F for days on end. He does say he might get an air conditioner this year for the upstairs bedroom, for me, of course. There used to be tennis balls here, to be thrown. They would get all dirty and then wear out the teeth of the border collie who carried them, so they got washed all the time. Occasionally one gets found underneath something, even after all these years. My job is, indeed, to keep the guy I live with occupied until we can go out into the back yard and do some gardening. I don’t know what my job will be there, but I suspect it won’t involve much. Maybe, “mobile ornament”. “Hand-me-downs” that’s what they are called. smaller animals of all kinds get them until they have their ‘full-size.’ Anyhow, you will probably have things that used to belong to another–a collar today, a leash tomorrow, toys, blankets and (as you have found out) furniture. When you are bigger, handsome not just cute, you will get things that are just yours. Humans are funny that way but you are still your own puppy even with an old collar. I have noticed two things: YOU ARE GROWING!!!! 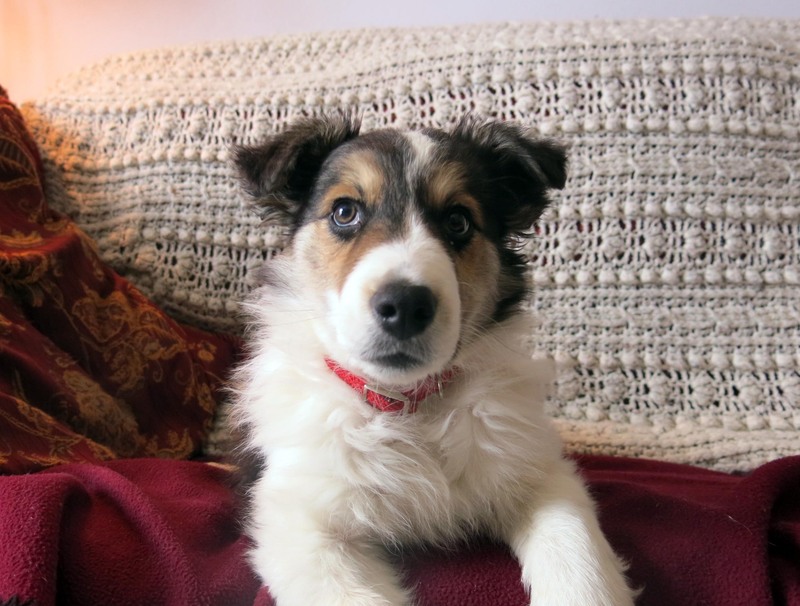 The second thing is you have ‘border-collie eyes’. Yup, those eyes will get you just about anything. My dog is part boarder collie but she has the eyes. Use the power wisely, Mani. Thanks; I think I do have “border collies eyes”. The guy I live with said there was a song like that in the 1980s…but I’m a boy dog. Today I got this thing called a “Kong” and I really like it. And a bigger fort for upstairs at bedtime. Life is rough. It’s been snowing here on the Isle of Long for 14 thousand days straight. But the movie of you leaping through the snow makes Winter worthwhile. Also, nice buttage on that stick-finding running-away shot. 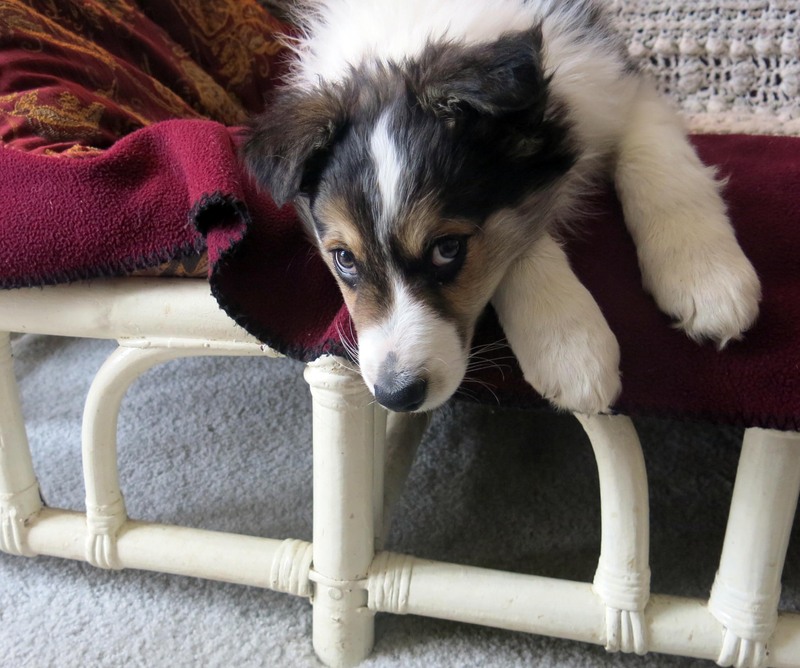 All the sticks in your backyard must beware: there’s a very fierce tiny purebred border collie in charge now. The guy I live with said just a little while ago that I’m in charge of rabbit control. I don’t know what that means. Maybe just running after them, which I can do. When the snow lingers on the ground here, rabbits start devouring everything they can find. (Instead of grass.) I see now why he doesn’t like snow lying on the ground for days. I, however, do. Personally, I think he’s drifting a little off center …… I do have very cute hindquarters, thank you.